Ways to Transfer Energy in Both Our Everyday Lives and Within Life Itself. Electromagnetic waves generally propagate out from a source in all directions, sometimes forming a complex radiation pattern. A linear antenna like this one will not radiate parallel to its length, for example. 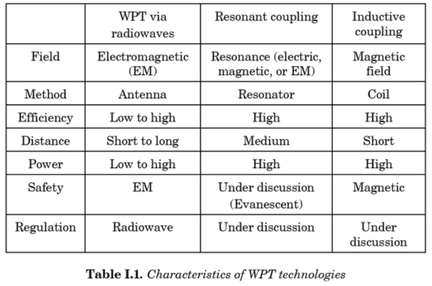 The wave is shown in one direction from the antenna in Figure 3 to illustrate its basic characteristics. Instead of the AC generator, the antenna can also be driven by an AC circuit. In fact, charges radiate whenever they are accelerated. But while a current in a circuit needs a complete path, an antenna has a varying charge distribution forming a standing wave, driven by the AC. 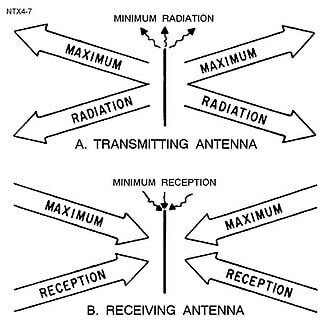 The dimensions of the antenna are critical for determining the frequency of the radiated electromagnetic waves. This is a resonant phenomenon and when we tune radios or TV, we vary electrical properties to achieve appropriate resonant conditions in the antenna. ​Electromagnetic waves carry energy away from their source, similar to a sound wave carrying energy away from a standing wave on a guitar string. An antenna for receiving EM signals works in reverse. And like antennas that produce EM waves, receiver antennas are specially designed to resonate at particular frequencies. An incoming electromagnetic wave accelerates electrons in the antenna, setting up a standing wave. If the radio or TV is switched on, electrical components pick up and amplify the signal formed by the accelerating electrons. The signal is then converted to audio and/or video format. Sometimes big receiver dishes are used to focus the signal onto an antenna. In fact, charges radiate whenever they are accelerated. When designing circuits, we often assume that energy does not quickly escape AC circuits, and mostly this is true. A broadcast antenna is specially designed to enhance the rate of electromagnetic radiation, and shielding is necessary to keep the radiation close to zero. Some familiar phenomena are based on the production of electromagnetic waves by varying currents. Your microwave oven, for example, sends electromagnetic waves, called microwaves, from a concealed antenna that has an oscillating current imposed on it. AM radio waves are used to carry commercial radio signals in the frequency range from 540 to 1600 kHz. The abbreviation AM stands for amplitude modulation, which is the method for placing information on these waves. (See Figure) A carrier wave having the basic frequency of the radio station, say 1530 kHz, is varied or modulated in amplitude by an audio signal. The resulting wave has a constant frequency, but a varying amplitude. A radio receiver tuned to have the same resonant frequency as the carrier wave can pick up the signal, while rejecting the many other frequencies impinging on its antenna. The receiver’s circuitry is designed to respond to variations in amplitude of the carrier wave to replicate the original audio signal. That audio signal is amplified to drive a speaker or perhaps to be recorded. FM radio waves are also used for commercial radio transmission, but in the frequency range of 88 to 108 MHz. FM stands for frequency modulation, another method of carrying information. Here a carrier wave having the basic frequency of the radio station, perhaps 105.1 MHz, is modulated in frequency by the audio signal, producing a wave of constant amplitude but varying frequency. Figure. Frequency modulation for FM radio. (a) A carrier wave at the station’s basic frequency. (b) An audio signal at much lower audible frequencies. (c) The frequency of the carrier is modulated by the audio signal without changing its amplitude. Since audible frequencies range up to 20 kHz (or 0.020 MHz) at most, the frequency of the FM radio wave can vary from the carrier by as much as 0.020 MHz. Thus the carrier frequencies of two different radio stations cannot be closer than 0.020 MHz. An FM receiver is tuned to resonate at the carrier frequency and has circuitry that responds to variations in frequency, reproducing the audio information. FM radio is inherently less subject to noise from stray radio sources than AM radio. The reason is that amplitudes of waves add. So an AM receiver would interpret noise added onto the amplitude of its carrier wave as part of the information. An FM receiver can be made to reject amplitudes other than that of the basic carrier wave and only look for variations in frequency. It is thus easier to reject noise from FM, since noise produces a variation in amplitude. Television is also broadcast on electromagnetic waves. Since the waves must carry a great deal of visual as well as audio information, each channel requires a larger range of frequencies than simple radio transmission. Satellite dishes and cable transmission of TV occurs at significantly higher frequencies and is rapidly evolving with the use of the high-definition or HD format. The wavelengths found in the preceding example are representative of AM, FM, and cell phones, and account for some of the differences in how they are broadcast and how well they travel. 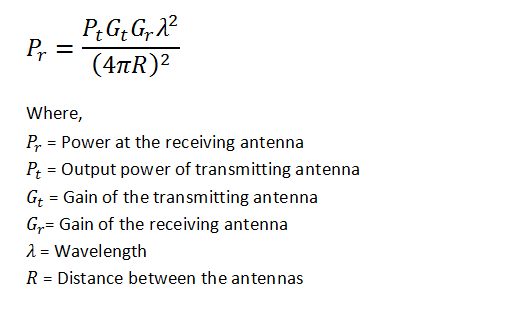 The most efficient length for a linear antenna is λ/2, half the wavelength of the electromagnetic wave. Thus a very large antenna is needed to efficiently broadcast typical AM radio with its carrier wavelengths on the order of hundreds of meters. One benefit to these long AM wavelengths is that they can go over and around rather large obstacles (like buildings and hills), just as ocean waves can go around large rocks. FM and TV are best received when there is a line of sight between the broadcast antenna and receiver, and they are often sent from very tall structures. FM, TV, and mobile phone antennas themselves are much smaller than those used for AM, but they are elevated to achieve an unobstructed line of sight. You know, we've known for some time you can send power over a distance. Nikola Tesla showed it a hundred years ago. NASA in 1975 demonstrated sending 30 kilowatts of power over several kilometers. Inductive Coupling Magnetic Stimulation (ICMS). Source and device recognizes it. Like an energetic handshake. Its a size and distance phenomenon NOT POWER!! This correlation with PEMF devices is not just metaphorical, it is LITERALLY the SAME!! 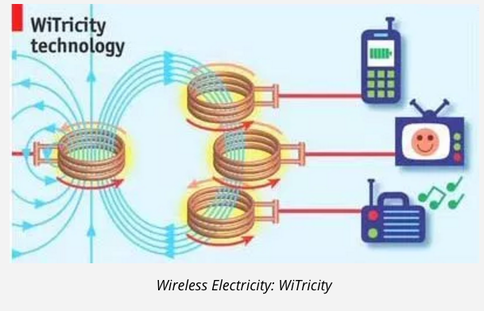 PEMF devices that use pure copper coils and earth frequencies (like the iMRS 2000) transmit energy wirelessly via magnetic resonance JUST LIKE Witricity! Also in PEMF just like Witricity INTENSITY IS NOT THE MAIN THING, it is FREQUENCY. Technology is finally proving what I have been saying all along. MORE IS NOT BETTER. Frequency RESONANCE is the KEY! The ONLY difference is that electronic devices are powered by HIGHER magnetic frequencies whereas the human body resonancts to LOWER frequencies so of COURSE you want lower frequency (and lower intensity PEMF). ALSO like the new wireless energy PEMF mats ALSO increase the flow of energy/chi, blood, lymph, nerve conduction, etc. It takes a certain amount of energy to get a current going in a circuit. The work done is against the back EMF and it is Recoverable unlike the heat lost in a resistor. (U is the energy, L the inductance and I is the current). It does not depend on how long we take to crank up the current, only on the geometry of the loop (in the Form of L) and the final current I. 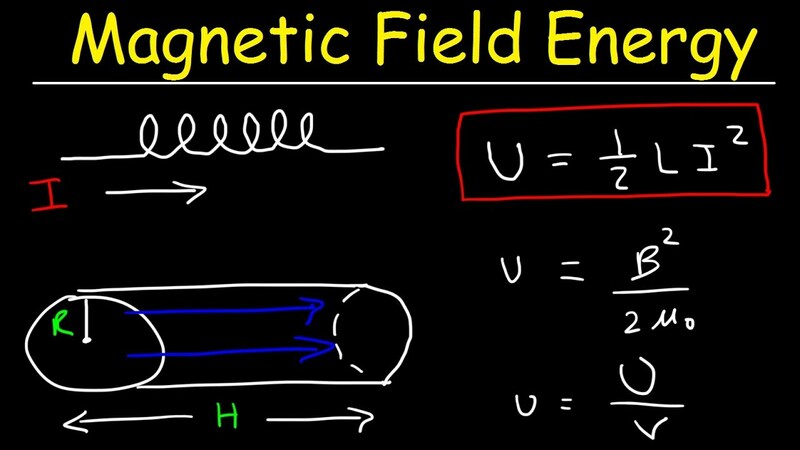 Another way to look at it is that the energy is STORED in the field itself in the amount U = B^2/2μo. When you change the current in an inductor it is going to fight it. But it is not like a resistor. I resister fights any current. An inductor only fights the change in current. Also unlike a resistor that loses all the energy to heat (light a lightbulb), the energy in the conductor is stored (like a capacitor) and can be used as energy. 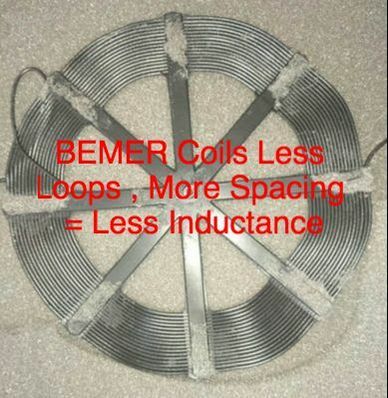 (Having thinner wires increases resistance which means more energy is lost as heat and LESS energy is available for the coils to deliver as stored magnetic energy in the field around the coil/inductor. (the inductor is the solenoid or coil). The distinction is one of bookkeeping, as the important quantity is the total energy. ​Excitable cells and tissues are poised to respond to weak signals, because large amounts of energy stored everywhere automatically amplify weak signals, often into macroscopic actions.